Todays article came out of necessity. As you probably know, I’m wrapping up my long awaited VR Course, and one of the last things I needed to create is a decal setup for the game built in it. To do decals properly, you’d want a full fledged decal system, but for this course and post, we have a system that does exactly what we need and no more. What is that? 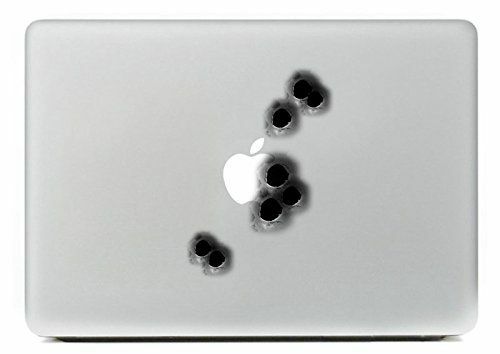 Well it’s a system to create a bullet hole decal where you shoot. And do to it without creating and destroying a bunch of things at runtime. It’s worth noting that I wrote this system for a VR game, but it is completely applicable to a normal game. This would work in a 3d game, mobile game, or anything else that needs basic decals. We open with 2 serialized fields. bulletHoleDecalPrefab – The first determines which decal prefab we’ll use. If you’re building a more generic decal system, you may want to re-name this. Because it’s part of a VR course, I left the name as is, but if I were putting this in another game, it’d likely be more generic or maybe even an array that’s randomly chosen from. maxConcurrentDecals – This sets the maximum number of decals the system will show. We do this primarily for performance, but also to avoid visual cluttering. Having too many decals could cause a hit on rendering, remember each one is a transparent quad. This number is variable in the editor though, so you can adjust it as you see fit for your game. We have two private fields in this class. They’re both using the Queue type to keep a first in first out collection of decals. decalsInPool – This is where we’ll store the decals that are available and ready to be placed. decalsActiveInWorld – These are the decals that we’ve placed in the world. As our pool runs empty, we’ll start grabbing decals from here instead. InitializeDecals() – This is our setup. Here, we create our queues, then we use a loop to create our initial pooled decals. InstantiateDecal() – Here we do the actual creation of a single decal. This is only called by InitializeDecals & a special editor only Update you’ll see soon. GetNextAvailableDecal() – This method gets the next available decal…. useful description eh’? It actually just looks at the pool, if there’s at least one decal in it, the method returns the first one in the queue. If there’s no decal in the pool, it returns the oldest decal that’s active in the world. SpawnDecal(RaycastHit hit) – This is our only public method, it’s the one thing this class is responsible for doing. In the code that calls it, we’re doing a raycast to determine where our bullet hits. The raycast returns a raycasthit and we pass it into this method as the only parameter. The method uses GetNextAvailableDecal() and assuming a decal is available, it places that decal at the raycasthit.point, adjusts the rotation to the raycasthit.normal, and sets the decal to active. The method ends by adding the decal to the decalsActiveInWorld queue. Everything else in this class is actually wrapped to only run in the editor. This code has a single purpose, to update our queue size at runtime. I won’t cover each method, but you should play with the queue size at run-time and watch as it keeps everything in sync.